- CI team qualified for the VEX World Championship scheduled to be held on April 17th at Disneyland, U.S.
Photo 1: Participants of VEX Robotics Korea Championship are maneuvering 'Sack' to the goal post located in the center. 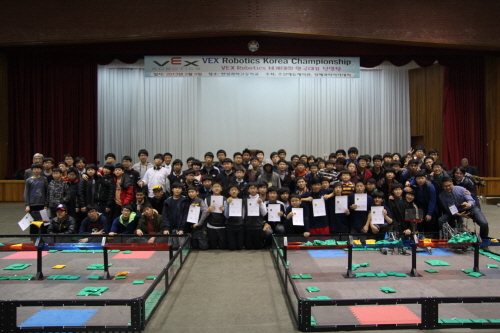 Co-hosted by Chosun Education and JH Science Academy to discover students talented in science through robot education, 2012-2013 VEX Robotics Championship (VEX) Korea Tournament was held on 9th at the auditorium of Hansung Science High School. Began in 2007, VEX has been solidified as the largest robot competition for teenagers in the world and had 7,100 teams from 23 countries participating last year. 18 middle and high school teams took part in the first Korea Tournament, including 'MinJokers' from Korean Minjok Leadership Academy, ‘6724 #1•2’ from Chadwick International, and 'Hansung' from Hansung Science High School. Teams went through preliminary round, main round, and final round, competing with each other for five hours for the ticket to World Championship to be held in Disneyland Anaheim Convention Center (Anaheim, California) on April 17th. The theme of this year's competition is ‘Sack Attack’. Each team has sacks at their side and the team that puts its sack in the goalpost placed at the center of the square-shaped field wins the game. All teams played three games at the preliminary round held in the morning and four teams that have won the most and gained the most points advanced to the main round. At the main round held in the afternoon the 4 advanced teams chose one of the lost teams as collaboration team, advancing 2 teams. These teams chose its partner team among those who did not advance to the next round. Members of both teams played as the same team, and these united teams went though the main round to be the winner. Photo 3: Team '6724#1' and '6724#2' from Chadwick International earned the Grand Prize and the Best Teamwork Award, respectively. The winner of the honorable Grand Prize and a ticket to the World Championship was team ‘6724 #1’. Composed of three 9th grade students from Chadwick International (Jinseong Kim, Seung Jin Yang, and Cole Hickenbottom), this team has distinguished itself from the first game in the preliminary round. ‘Iron Ore’(Jihyuk Ko, Minki Kwak, Honggyu Shin, and Soohyun Cho), a team of 7th grade students from Daedeok Middle School in Daejeon, earned Gold Award. Yoonsik Kim from Chungbuk Mechatronics High School (10th grade) and Cheongju Seowon Middle School students Seongwoo Hwang (9th grade), Woochul Lee, and Injun Lee (8th grade) formed a team 'Black Bear' and earned Silver Award. Team 'MinJokers,' seniors from Korean Minjok Leadership Academy (Seongwoo Bae, Seungin Ryu, Seongjae Hwang, Inchan Hwang), has won Bronze Award. Chadwick International's another 9th graders’ team ‘6724 #2’ (Kyungryul Park, Suwon Chai, Seunghui Hur) that entered as a collaborating team and ‘Robot of Legend 2’ (Senior Joonho Kim and Taeho Kim, Junior Jinho Kim and Sunghun Chang) from Chungnam Mechanical Technical High School has respectively received Best Teamwork Award and Good Teamwork Award. Moreover, team ‘Robot of Legend 2’ and 'Robot Style' (alliance of 10th graders from Gaepo High School, Youngdong High School, and Whimoon High School students) won Design Award regardless of their ranking in the tournament. Director of JH Science Academy Jongchun Woo said, "Although it was the first tournament held in Korea, I saw some outstanding ideas in building robots and enjoyed observing well-played games throughout the event." He added, "It was somewhat unfortunate for a few teams being disadvantaged due to the lack of understanding on VEX global rule. The event, however, presented awesome works from relatively young students, showing the chance for domestic tournaments to be more active and the possibility for good records in the world championship." 로봇 교육을 통한 과학영재 발굴을 목표로 조선일보 교육법인 조선에듀케이션과 정혜과학아카데미가 공동 주최하는 ‘2012-2013 VEX 로보틱스 세계대회’(이하 VEX) 대한민국 대표선발전이 9일 한성과학고등학교(서울 서대문구) 대강당에서 개최됐다. 2007년 시작된 VEX는 지난해 23개국에서 7100여개 팀이 참가할 정도로 명실상부한 세계 최대 청소년 로봇 경진대회로 자리 잡았다. 올해 처음 치러지는 한국 대표 선발전에는 민족사관고등학교 ‘MinJokers’ 채드윅국제학교 ‘6724 #1·2’ 한성과학고 ‘Hansung’를 비롯해 중·고교 18개 팀이 참가해 열띤 경쟁을 펼쳤다. 오는 4월 17일부터 나흘간 미국 디즈니랜드 애너하임컨벤션센터(캘리포니아주 애너하임시)에서 개최되는 세계대회 출전권을 두고 펼쳐진 이번 대회는 예선전, 본선전, 결승전으로 약 5시간에 걸쳐 진행됐다. 올해 대회 주제는 ‘색어택(Sack Attack)’. 정사각형 모양 필드에서 자기 진영에 놓인 자루(sack)를 필드 중앙 골대에 넣으면 이기는 방식이다. 오전에 치러진 예선전은 팀별로 각각 3차례 경기를 치른 뒤 다승 및 다득점으로 4팀을 선발하는 방식으로 진행됐다. 오후에 열린 본선에서는 상위 4개 팀이 예선전에서 탈락한 팀 가운데 한 팀을 협력팀으로 선택해 함께 경기를 치러 2개 팀을 선발하고 결선에서 최종 한 팀을 선발했다. 영예의 대상과 세계 대회 출전권은 예선 1라운드에서부터 두각을 나타낸 채드윅국제학교 1학년 김진성, 양승진, 콜 히켄바텀군으로 구성된 ‘6724 #1’에게 돌아갔다. 금상은 대전 대덕중학교 1학년으로 구성된 ‘Iron Ore’(고지혁, 곽민기, 신홍규, 조수현)가 은상은 충북전산기계고 1학년 김윤식군과 청주 서원중 황성우(3년), 이우철, 이인준(이상 2년)으로 구성된 연합팀 ‘Black Bear’, 동상은 민족사관고등학교 3학년으로 구성된 ‘MinJokers’(배성우, 유승인, 황성재, 황인찬)가 차지했다. 협력팀으로 결승에 진출한 채드윅국제학교 ‘6724 #2’(박경률, 채수원, 허승휘·이상 1년)과 충남기계공업고 ‘Robot of Legend 2’(김준호·김태호 이상 3년, 김진호·장성훈 이상 2년)에게는 각각 최우수 협력상과 우수 협력상이 수여됐다. 또 뛰어난 디자인으로 주목받은 ‘Robot of Legend 2’와 개포고, 영동고, 휘문고 1학년으로 구성된 연합팀 ‘Robot Style’에게는 순위와 별도로 디자인상이 주어졌다. 우종천 정혜과학아카데미 이사장은 "국내에서 치러진 첫 대회인데도 로봇 제작 아이디어는 물론 경기 운영 면에서도 수준 높은 경기가 펼쳐졌다"며 "VEX 국제 규정에 대한 이해가 부족해 불이익을 당한 팀이 있어 아쉬움이 남지만, 상대적으로 어린 학생들의 선전이 두드러져 향후 국내 대회 활성화는 물론 세계 대회에서의 성과도 기대된다"고 말했다.